And so E3 – The Electronic Entertainment Expo – begins for its first day of big announcements, trailers, and gameplay demos. The Schedule of presenters today is Microsoft, EA, Ubisoft and Sony to close out; but even though Ubisoft isn’t set to start revealing the new installments of their Assassins Creed franchise until 6:00 ET (3:00 PT), Microsoft already gave us a sneak peak into one of the biggest new developments of the game – Co-Op mode. Assassin Creed games first started the trek into multiplayer back when Assassins Creed II: Brotherhood debuted in 2010; but Co-Op is something completely different. Rather than their own maps and player vs player action, Co-Op offers a chance for players to play alongside other players in the storyline. 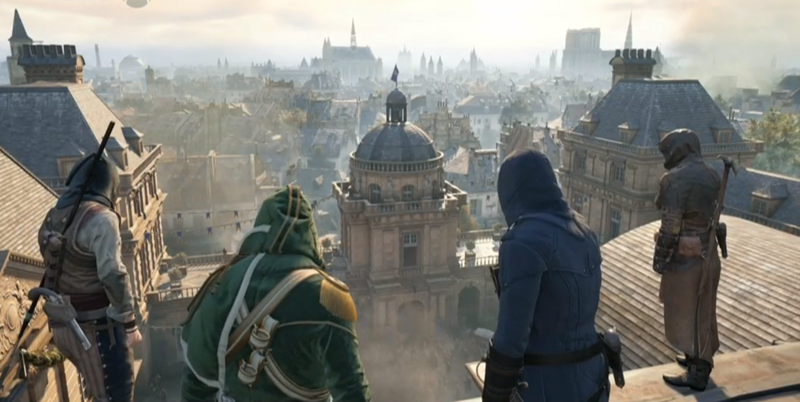 The gameplay demo at the Microsoft conference will make more sense once Ubisoft takes the stage later this afternoon. Also, it’s important to remember that these are all initial game footage and additional details will be added in and refined later. Though despite that the game still looks beautiful. As we expected, Assassins Creed: Unity truly puts you in the middle of the fires of rebellion that was the French Revolution. With guillotines and severed heads on pikes, this certainly looks like a much more vicious game than past installments. Please subscribe and stay tuned for the complete Assassins Creed E3 Update. With both Assassins Creed: Unity (PS4) and their PS3 game Assassins Creed: Comet coming this Fall, you can be sure there will be a lot more new coming. So stay vigilant Assassins; more news is coming VERY soon! What effect this Co-Op will have on others games remains to be seen. If there is no Co-Op activated, then perhaps they’ll function as regular Brotherhood members. We’ll know more after Ubisoft’s conference later today.